Imagine a light bulb you can bend around any surface, for hundreds and hundreds of feet, indoors or out. It’s as thin as a credit card and costs a fraction of what other LED, fiber optics, neon, or fluorescent lighting systems cost to operate or maintain. That’s Light Tape®! Light Tape® is the longest, thinnest, brightest and most durable electroluminescent light in the world. Combine Electro-LuminX®’s patented technology and manufacturing processes with the best materials available and you get Light Tape® Lamps. They utilize SYLVANIA®’s premium quality light emitting phosphors and Honeywell®’s Barrier Laminates to guarantee that we deliver the highest quality lamp possible to our customers. Light Tape® is essentially a flat light bulb utilizing phosphors as a light source similar to Plasma televisions. The brightness of the lamp is directly correlated to the amount of current supplied to illuminate the lamp. The lower the brightness or current, the longer the phosphor lifetime. Adjusting the brightness wil alter the lifetime curve. Other options, such as flashing, will double the useful life. Not only is Light Tape® easy to install, but its easy on the wallet. This unique low energy design uses less than 7 watts per square foot (0.5 watts per linear foot) with even lumination. year in operating costs. Also, since Light Tape® is dimmable, you can dial in your brightness. Drop your energy consumption to less than 2.4 watts per linear foot! 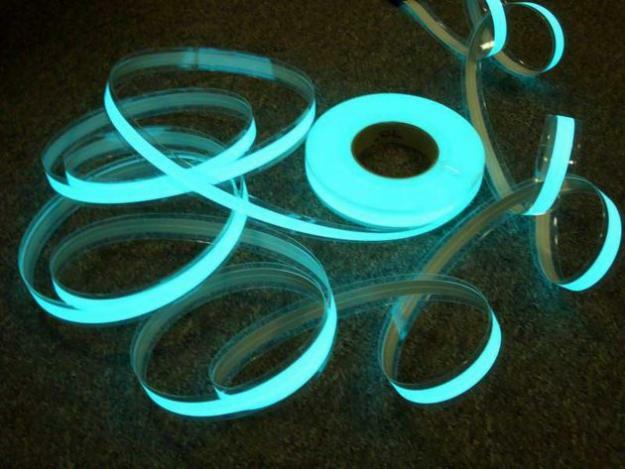 Light Tape® is available in a variety of colors. Base colors are natural blue and natural green. Please check back for updated and new colors as they become available. Custom color matching is possible depending on volume. backing buffer to significantly reduce the noise. Strips ensure that the product is securely mounted to the surface panel to eliminate any noise. Again, make sure the panel is firmly secured in a frame. Sometimes, the power supply must be located far from the lamps. In this case, shielded conduit may be required to protect against high frequency and high voltage. It is made of polycarbonate that is highly resistant to heat and nature’s elements. These enclosures offer 100 feet diameter connection span– it is possible to install the Light Tape® up to 50 feet from the power central location. Electrical Metallic Tubing (EMT) conduit is required to shield the high voltage, and you should always follow all local electrical codes. It is important to consider your environment when installing Light Tape®. For example, it may be important to specify an outdoor barrier encapsulation for an indoor application. Light Tape® must be able to “float in all exterior installations.” Do not adhere one side or bend long runs around corners. Do not fold or kink Light Tape outdoors. Do not use aggressive contracting adhesives to mount the Light Tape® lamp. Floors, wet locations, or high humidity areas require exterior barrier encapsulation. Since Light Tape® is dimmable, you can dial in the brightness level. This makes it the most inexpensive, energy efficient lighting option available, costing only about $80 a year*. 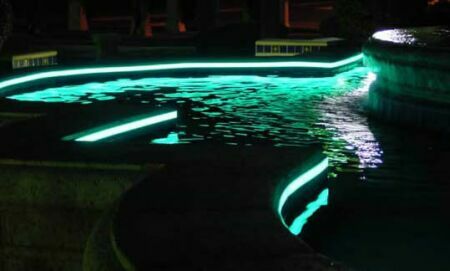 This compares to fluorescent and neon lighting, both costing about $1700 annually. Even LED, the “energy efficient” choice, costs about $500 a year to operate. Light Tape has tremendous impact resistance properties which makes it difficult to damage. However, it is important to protect Light Tape from abrasion, which can damage the barrier lamination. To optimize the illumination versus lifetime balance, it is important to consider the ambient light of your venue. The appropriate illumination effect should be determined on a per application basis. We can preset power supplies or adjustments can be made on-site to match customer requirements. NEVER operate Light Tape® when in a coil. Always consult local electrical codes for wiring or other specifications and regulations. Take care to mount the Light Tape® out of reach of children or malicious individuals. Always seal Light Tape® if cut with Light Tape® Edge Guard™. Do not step on Light Tape® during installation. Avoid hard creases. Do install in dry conditions. Do not cut or expose open ends to moisture. Do not break lamination when pulling around sharp edges or corners. Do not use a screwdriver or sharp object to force lamp into tight areas. Do not fold, twist, rotate or kink lamination excessively. Do not stretch, puncture or crease Light Tape®, as it will destroy conductive layers causing black spots or failure. Do not operate lamp outdoors during peak daylight hours. Do use for a photo-cell outdoor installation, to keep the Light Tape® from operating in peak daylight hours. Do not operate Light Tape® without protective lamination. Do not cut or puncture Light Tape® while power supply to lamp is on. Do not thermoform or stretch Light Tape® over objects, or bend Light Tape® in a tight radius. When cleaning Light Tape® or Smart Driver™ Lighting Ballasts, do not use water or chemical cleanser. Do not operate Smart Driver™ Lighting Ballasts outside unless in a NEMA enclosure. In industrial applications, use caution when operating Smart Driver™ Lighting Ballasts as they have not been explosion-proof rated.